Yesterday Aidan had a pretty good day. He was able to go on a "Vec Holiday" which is where they take him off the Vecuronium (the medication that keeps him paralzyed) until he starts moving again, just so that they don't have this medication running through his body all day everyday. Usually patients start wiggling fingers and toes to let the nurses know its time to go back under....not Aidan! Aidan started moving his head after only an hour and 15 minutes. Today when they put him on holiday, he lasted only 45 minutes before he began breathing over his ventilator. I asked the nurses if that isn't an entirely bad thing because my line of thinking would be if he is coming out from the paralytics quickly then he is getting just enough medication to keep him comfortable and that he is "fighting" the medication because of how strong he is. And for breathing over the vent that it would just mean that his lungs are so strong that they want to keep working and keep everything in order, so couldn't we just take him off the vent. The nurses explained to me that while yes that is all true, they don't want him doing any of that. Right now because he is in such a critical stage if he breathes over the vent he could pop a stitch/suture (which would definitely be bad!) and they can't take him off the vent because when he is paralyzed his lungs don't work by themselves at all, therefore he would stop breathing(we definitely don't want that!). Because Aidan isn't getting much time off of the Vec the doctors are probably going to have to increase the amount he is getting. Aidan also seems to be doing a great job growing his esophagus!! Today Dr. Hess and Kirsti (Dr. Foker's NP) began the process of adding "straws" to his "buttons" As you can see in the picture below, lots of straws got added. Basically to help you understand what you are looking at i'll explain it a bit. Each "button" has 3 sutures, so if after looking at the daily x-ray they see growth, one person will grab a clamp and pull on each suture one at a time to get more tension and then the other doc will add tiny pieces of straws/coffee stirrers (by the way, they really do look like coffee stirrers) until they aren't able to add more. 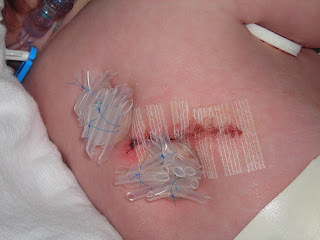 For Aidan today, 2 of the sutures got 4 straws added, 2 got 3 straws, 1 got 2 straws and another only got 1 straw. I was amazed by how many straws he got on his first day!!!!! If we keep up at this rate I really think it will be less than 2 weeks of growing, i'll have to ask the docs later tonight or tomorrow what they think! im glad to here hes progressing well . hes such a little trooper ! i hope you guys are holding up as well! Glad to hear things are better. We're proud of you both for your strength and love. Praying for Baby Aidan and you always. Can't wait to see you at home. Happy belated Birthday Mike. I hear things change after 30! I'll be there next year.